Documentation is an essential function in law enforcement. It needs to be accurate and thorough, but not so time-consuming that it compromises other critical functions of public safety officers. Increasingly, law enforcement agencies are using speech recognition software to complete reports while avoiding the laborious task of hand typing. How can speech recognition software assist you or your officers? 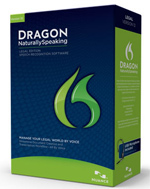 Speech recognition software is inexpensive, simple to use, works on any recent vintage Windows-based pc, and allows rapid creation of text using voice in virtually all common word processing and report-generating programs. Sometimes "seeing is believing". 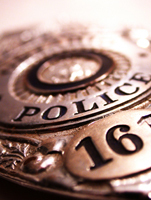 See how a police department in Clearwater, Florida has used speech recognition software to improve officer productivity. Inexpensive Replacement: Are you using Dragon non-mission-critical dictation but lost the microphone that came with your product and looking for an inexpensive replacement? Check out the Cyber Acoustics AC101 or AC201. They're comfortable, durable, inexpensive, and work fine. Cost effective upgrade: Looking to upgrade from the microphone that came with Dragon but have a limited budget? Consider the Radio Shack Sennheiser knockoff. This product offers a significant improvement in the accuracy and external noise rejection without emptying your wallet. USER GUIDE: Virtually everything can be learned by reading the User Guide, but this is often a slow and laborious process which may excessively time consuming for the average user. Click here to see a list of User Guides. DRAGON END-USER WORKBOOKS: these are a series of workbooks designed around each Dragon release which provides valuable information. These are free to download. Click here to see the currently available workbooks. 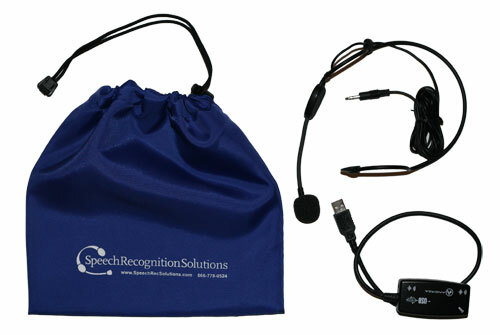 Recommended package for best speech recognition results! For predictably great results we recommend using the Sennheiser ME3 with the Andrea USB sound adapter. This is our best selling microphone and the one we use ourselves. To make the purchase of this relatively expensive hardware a bit more bearable, we offer special savings when you purchase all three of the main items in this package. Comments: We believe that with suitable hardware and good enunciation, this package will offer the best accuracy and unrivaled noise cancellation. This is the microphone to which all others are compared. Special Combo with Sennheiser ME3 (standard audio plug) and Andrea USB Sound Adapter.